We set off for the hunt just as dawn breaks. Or at least the gang of ruffians sets off, with Matty and Sarah in the lead, and I follow some distance behind, as silent and subtle as only a heroic feline can be. I trail them for an hour or so as we climb down onto the grassy plains. Not that I will need any of these for killing tiny flightless birds. I expect I will merely have to pounce on them and they will die of fright. One of the ruffians (it might be Jonesy) has been out scouting earlier, and Matty and Sarah meet him on the eastern edge of the plain. He points to a fringe of trees and raises his finger to his lips. Most of the gang (including Sarah) skulk downwind, their weapons at the ready. But two of them creep around to the other side of the trees, ready to drive the emus towards their fellows. It is not a bad plan, for humans. But I shall beat them to the kill. 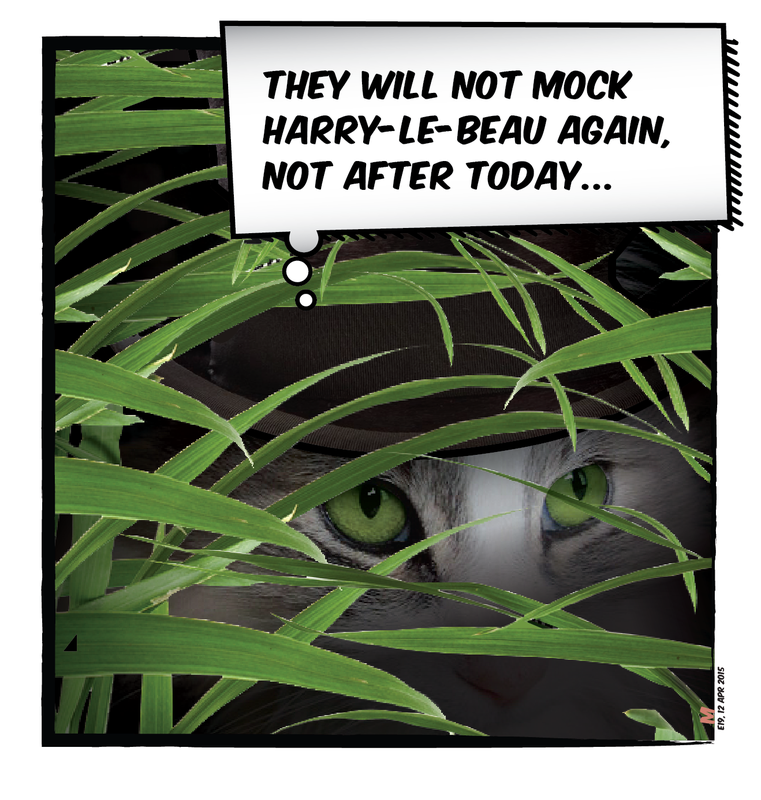 They will not mock Harry-le-beau again, not after today! I creep through the long grass until I am right on the edge of the trees. I race up the nearest trunk, so quick and nimble that even Sarah does not see me. And there I wait. I can see a path of sorts beneath me, made by some larger animal – a kang-oo-roo perhaps. The tiny emu birds will pass along it as they run, and I will drop onto them from above, and kill thirty or more before Matty and his men have time to aim their ridiculous guns. And I will not be satisfied with one miniature leg. Oh no. I, Harry-le-beau will eat the whole emu, and spit out the little bones. Why, I will probably eat twenty or more! I must leave some for Sarah, because she is kind, but Matty and his friends will have to make do with leftovers. I hear a rustling in the bushes. It is much louder than one would expect from tiny emus. There must be more of them than I thought, which is good. Perhaps I will kill fifty of the creatures. And eat forty-five. The rustling is coming closer. The bushes are thick right up to the trunk of my tree, which is where they give way to the path. I will have to leap a split second before I see my prey; luckily my ears are as keen as my wits, and my timing has been admired from Berlin to Rome. Closer now. Closer. Out of the corner of my eye I can see Matty and Sarah bracing themselves. They will not get a clear shot until the emus are right out of the bushes. Except by then, the little birds will be dead. ‘Hoooop hoooop hoooooo!’ shout the men. Rustle rustle, go the bushes. They are nearly here. My teeth chatter with anticipation. My tail flicks from side to side. Any moment now. Wait. Wait! Here they come! And I leap . . .
oh oh … what a terribly brilliant place to end this chapter. 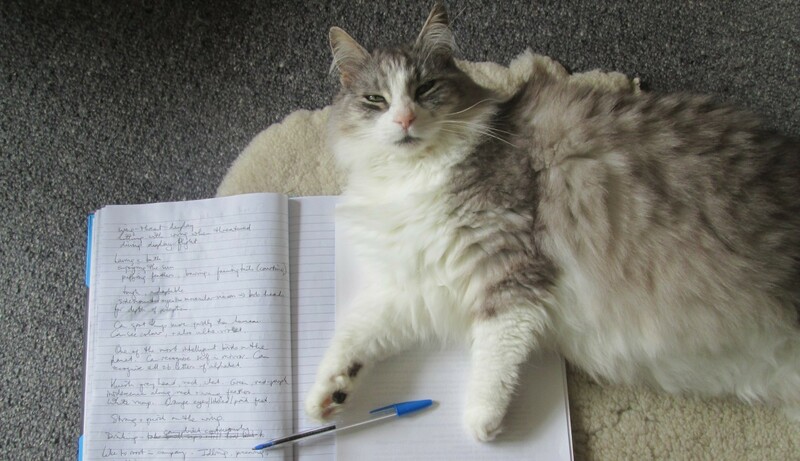 I must hold my breath until the next posting.